Summer presents the perfect time to start your roof repair Phoenix project. The sun is shining, there isn’t any rain, and weather conditions are favorable, in general. While there are many do-it-yourself projects to undertake, there are some important aspects to consider before starting on your roof. An estimated 2 thousand people die each year from falling off roofs. This number accounts for homeowners undertaking do-it-yourself projects, but it also accounts for professionals. 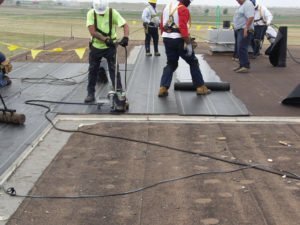 The issues that cause this are slippery surfaces, pest damage, gusts of wind, leaves and other debris left on the roof that cause damage and simple cases of people losing their balance. Many more people are injured while on the roof, which results in broken bones, bruises and twisted ankles. Oftentimes, pests like bees and wasps make their nests in hidden areas on the roof. Any disturbance can cause them to attack whoever is nearby. These instances can also cause people to fall from trying to escape them. These situations prove fatal. This is especially true for the person who is allergic to them. It’s harder to maintain balance on the roof. From ground level, the roof doesn’t appear to be that steep, but once you’re on the roof, you see that it’s another story. This is why, in part, slipping is a real concern. While homeowners can study, in theory, what it takes to repair or replace a roof, until they have had sufficient experience in repairs and replacement, it’s a difficult undertaking. It’s not enough to make repairs. They have to be done right. For example, failure to properly install shingles in the right manner can and will lead to costly repairs down the road. It can result in needing the whole roof replaced, compromised structural integrity to the house, water damage and mold issues. This is why we, at JBS Roofing, offer our extensive services to you. We have three decades of experience in roofing repairs and replacements in the area, and we are familiar with the common roofing issues the Phoenix metropolitan area presents. There are signs of roof damage that would not be evident to the untrained eye. Roofs that need to be repaired can cause interior damage to the home. Many people don’t consider what water and water damage can do to a home. Water damage can cost thousands of dollars to repair. Where there is water damage, there will be mold. Mold remediation is not cheap either. Are you able to spot weak areas of the roof? Do you know what happens when debris is allowed to collect on the roof? Attempting a do-it-yourself project with so many unknowns can cause further damage. Depending upon your know-how, trained eyes and skill to tackle do-it-yourself projects, you may be unhappy with the results. However, an ugly roof goes beyond aesthetics. An ugly roof can be an unsafe roof. 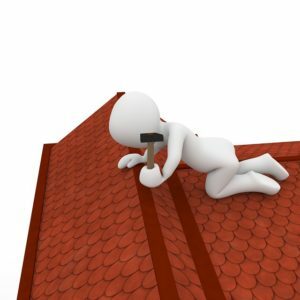 If you have unsealed flashing, uncaulked nail holes, exposed nails, water leaks, improper sealing of pipe jack, roof wear, damaged decking, curled shingles, missing shingles, water stains, missing or loose ridge caps or vents, you will have to repair or replace your roof again. The job needs to be done right, and it needs to “look right”. Let’s face it: There are so many wonderful things you could be doing with your time while we professionally handle your roof. We can handle your roofing project in a fraction of the time it could take you. The summertime is the best opportunity to get away from the home and beat the heat. It’s not the time to be hot on your roof, and you know how hot the Phoenix area can get. Leave the roofing to us. The most enthusiastic do-it-yourselfers attempt projects in order to save money, and that’s a wonderful thing. We want to save you money too. The sad reality is that accomplishing a roofing project ends up being costlier than hiring professionals to do the job. For instance, we are able to buy our roofing materials and tools in bulk. We also know what it takes to be efficient. Both of these aspects save you money. Your time is valuable. You don’t want to be wasting it up on your roof. Contact us today at (623) 247-9252. Don’t wait for a sudden downpour to cause your home water damage or worse. We provide free roofing estimates, and we are free to answer your roofing questions.